Compared to Giggle Hollow, across the valley to the south west on Belleayre, its name is rather boring, but the trail is far from dull and is the home of a memorial (pictured above) to the late naturalist John Burroughs with a small stone seating area. 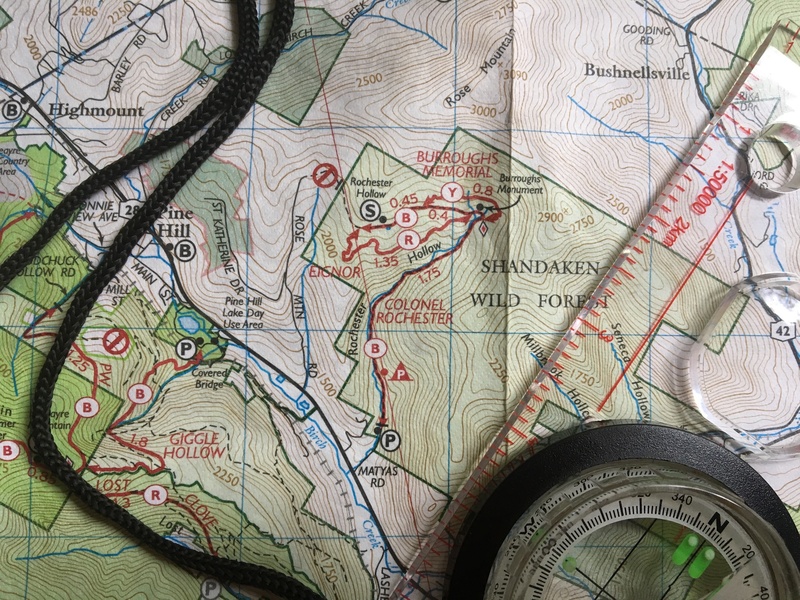 Though the Rochester Hollow trail is relatively gentle, it’s still a worthy trek, the whole trail being a lasso-shaped loop that’s made up of three intersecting trails blazed red, blue and yellow for a total, round-trip length of 6.5 miles that can be completed by an experienced hiker in about 3 hours. As you’ll see from the NYNJ Trail Conference map above, the trail is comprised of three sections that form a loop. 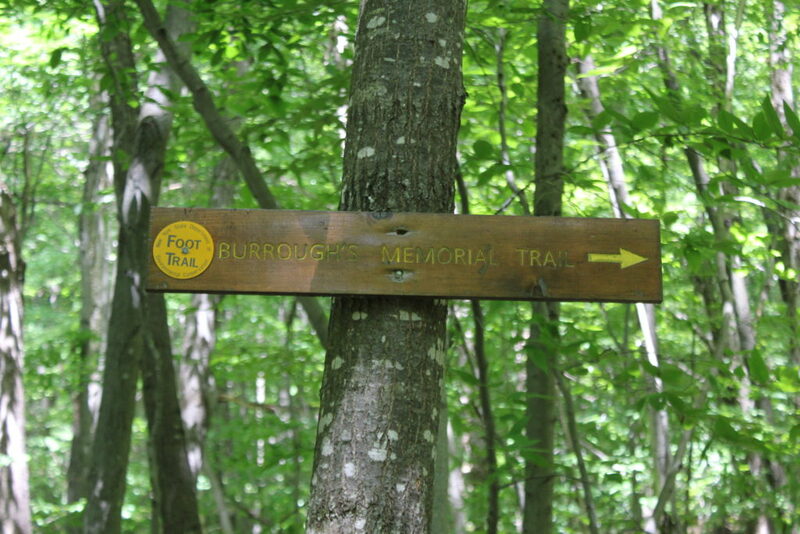 From the parking lot, the trail is blazed blue (Colonel Rochester Trail) and runs for 1.75 miles, roughly where you’ll find the Burroughs Memorial. Then it goes on for another 0.4 miles where it meets one end of the yellow-blazed trail (the Burroughs Memorial Trail) and then continues on for another 0.45 miles where it meets the red-blazed trail (Eignor Trail). The 1.35-mile-long, red-blazed trail loops south and east back from the end of the blue-blazed trail to the middle of the blue-blazed trail near the Burroughs Memorial. 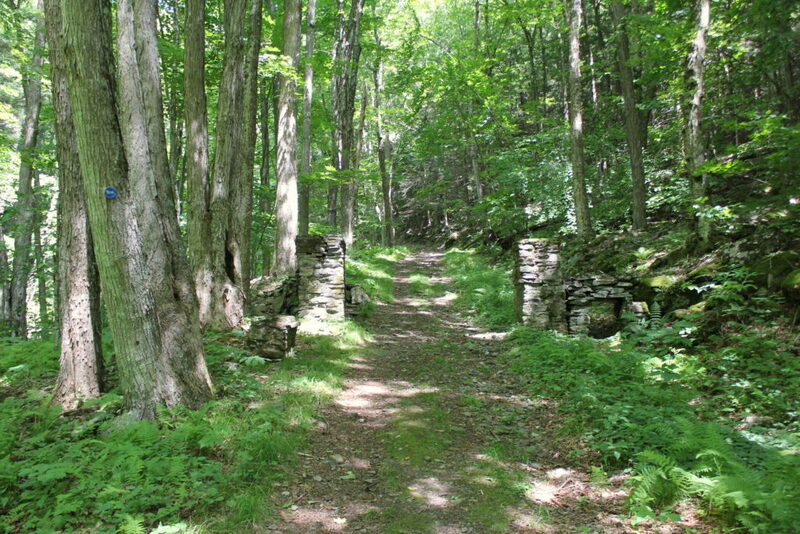 The beginning of the trail that follows the creek – dwindling this week due to the drought – is basically an old dirt road with the remains of stone pilings that once held gates in place and gives the impression of having once been the long road to a stately mansion. 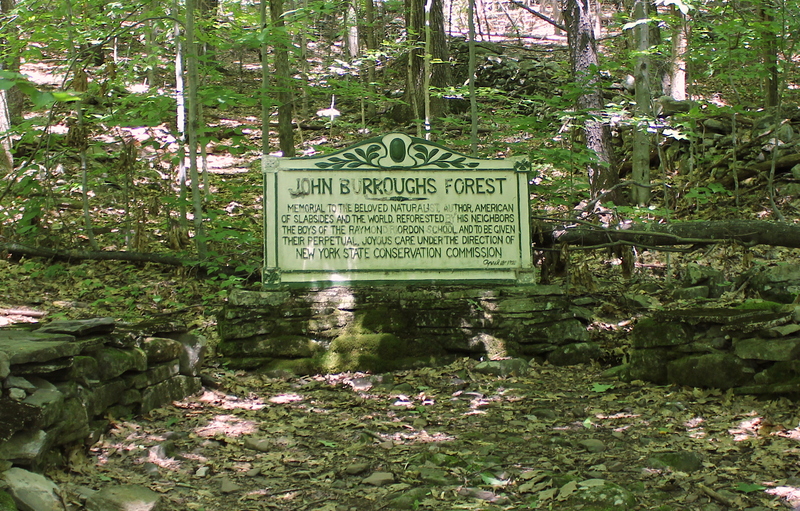 On both the Burroughs Memorial Trail and towards the end of the Colonel Rochester trail, you’ll find many, large stone foundations and sturdy, six-feet-tall rock walls to investigate. In the first half-mile, there is a primitive camping spot that’s big enough for a large family campsite. At the beginning of the Eignor trail, you’ll find a lean-to. This is an accessible lean-to campsite (with hardened surfaces, accessible picnic table, fireplace and privy). This is the perfect hike for a large, family gathering of assorted ages. Strollers were seen easily managing the descent on the Colonel Rochester Trail and according the relevant page on the NYSDEC website: “access by ATV is granted only to Motorized Access Program for People with Disabilities (MAPPWD) permit holders”.